Corporate Profits Are the Stock Market’s Foundation. What Will Break Them? Hidden Key to Regime Change in the Stock Market. The daily flow of economic statistics misleads even sophisticated analysts into watching the short-term trends while forgetting the long-term basics that often determine events – as we see today, with analysts chattering about beats of quarterly earnings and expectations for Friday’s employment report. The first plays a pointless manipulated game. The second concerns an impossible-to-accurately-predict, heavily revised, slow-changing metric (non-farm payroll growth has been 1.7% – 2.2% year-over-year for the past 15 months). Larger factors drive the stock market, creating the macroeconomic foundation for bull and bear markets. 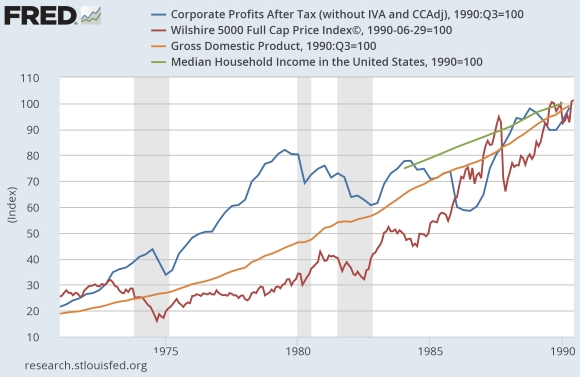 One of the most dramatic trends of the past generation has been the rise in corporate profits. It has helped reshape America, powering a three decade long bull market. What created it? What will end it? 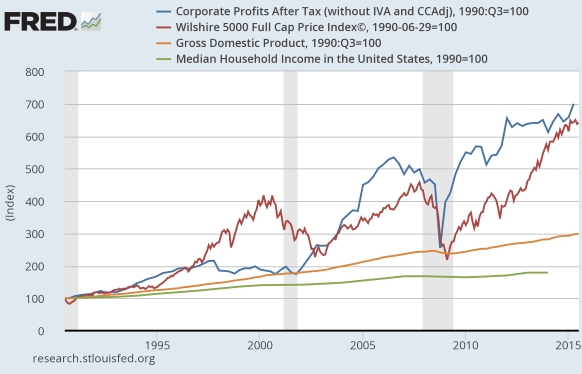 Corporate profits, household income, stock prices, and GDP all grew at roughly the same rate for 20 years. But this didn’t please everybody, and much money and effort was invested to produce a New America. We see the results below: profits and stock prices grow strongly while GDP and median household income grow slowly (all lines indexed to 1990). This is the basis for the stock market rise of the 21st C. Since Q1 2001 (peak of the 1990s economic expansion), corporate profits after tax have grown 372% (while shares outstanding in the SP500 remain roughly unchanged) — powering the rise in stock prices. The giddy enthusiasm generated has brought most valuations to (or above) their peaks from 1926 – 1999. No surprise how this was done. Employers crushed private sector unions, with the help of unions’ suicidal mismanagement. Minimum wages were eroded away by inflation. Regulators such as OSHA remained relatively toothless, with their tiny budgets (OSHA has only 2,000 inspectors) and trivial fines. Corporations learned to organize to reduce the need for a trained workforce. They shifted to part-time workers, had hard ceilings for wages to discourage long-term workers, shifted employment to third-party “temporary” agencies to give more ability for discretionary firing, supporting high rates of immigration (to keep wages low) — this and a thousand other techniques helped corporations (and their senior executives) to harvest for shareholders and executives the fantastic gains in productivity during the past 30 years. The resulting level of corporate profits gives strong support to stock prices. What might destabilize the US stock market, creating a regime change to lower prices? That’s the big question, more important to foresee than a bear market that interrupts and refreshes the long-term upward trend. A recession seems likely during the next few years (US or global), which will depress stock prices for a few years (in the extreme case of the Great Recession it did so for 5+ years), as the government employs its powerful countercyclical tools. That’s just the business cycle in action. Rising rates — reversing the 33-year-long bond bull market — might depress stock prices, although the past shows no clear correlation. But Treasury yields probably will remain low despite Fed and Wall Street dreams of “normalizing” rates (natural interest rates are zero) — until growth accelerates and breaks us from the post-2010 slow mode. A decisive change in sentiment would lower valuations. But Investors’ animal spirits probably will remain high so long as good news is good news (growth!) and bad news is good news (stimulus!) — which results from investors’ confidence in the Fed “put” (aka belief in Central Banks mythological ability to tune the economy). I suspect it will happen eventually as a result of an unexpected and large-scale event. As always, geopolitical shocks can hurt the market. But that’s always true. None of the usual suspects seem likely during the next few years. Despite the usual sky is falling prognostications of strategists, the post-detente peaceful world seems likely to continue. Nuclear powers do not fight with each other, and the slow growth in the number of States with nukes puts a ceiling on the scourge of State to State warfare. Terrorists are a threat, as they have been since the late 19thC when anarchists began their 50-year long “propaganda of the deed” terrorist campaign. But although they can cause a crash, they’re unlikely to force a revaluation of the market. Natural events such as plague and extreme weather have shaped history in the past, and will do so again. They are wild cards, unpredictable demons in the fat tails of the market’s return distribution. I suggest we seek the forces that might end corporations’ reign of high profits among the forces that caused it. — Jeremy Grantham in Barron’s, 28 January 2015. 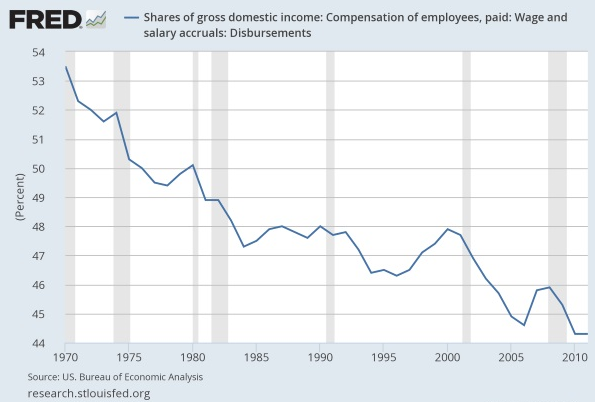 Economists long believed that profits/wages’ share of both Gross Domestic Income and corporate revenues were mean-reverting, flowing up and down in long cycles. Their long fall after WWII resulted from the political settlements of the New Deal. Their long rise occurred as that political coalition lost power in the decades after 1970. Shareholders have been among the major beneficiaries of higher profits. But there is a cost paid by America for so much of the national income shifting into corporate profits. People need money to buy the products and services produced by corporations; corporations need capex to grow. Both have been starved as profits grew. The stagnation of real household income removed the “fuel” for rising sales. Borrowing sustained consumer spending during the 1982-2007 era, as mortgage debt rose from $1 trillion in 1983 to a peak of $10.8T in 2008, and consumer debt rose from $400 million to $2.7T. From Q4 1948 to Q2 1960: 52.9% (3.8%/year during the tough post-WWII transition). From Q2 1960 to Q4 1969: 51.6% (4.6%/year). From Q4 1969 to Q1 1980: 38.4% (3.2%). From Q1 1980 to Q3 1990: 37.7% (3.1%). From Q3 1990 to Q1 2001: 40.7% (3.3%). During the 14 years from Q1 2001 to Q2 2015: 29.2% (1.8%, aided by massive stimulus). Slow GDP growth with costs stagnant or growing means little sales growth and even less profits growth. After the tech and housing busts, corporations relied on cost-cutting and boosting efficiency, plus financial engineering, to grow profits. Now these tools are played out. Companies find productivity gains difficult to obtain — sometimes even seeing their costs rising (e.g., Wal-Mart increasing staffing and wages) and stock buybacks no longer reliably boost stock prices. Worse for them, the legal tide is changing as courts and regulators slowly begin to question the games that allow companies to avoid responsibility for their employees (e.g., classifying workers as “exempt” managers, creating the illusion of employment by third parties through long-term use of “temp” agencies, and the legal fiction of workers as “independent contractors”. As Massey Energy’s CEO, Don Blankenship was contemptuous of the Mine Safety & Health Administration; now he’s on trial for the death of 29 miners due to his company’s disregard of safety rules. These changes make slowed profit growth almost inescapable for the stock market, an unpleasant surprise to investors enjoying stratospheric valuations. These are harbingers of the changed economic and political dynamics of a slow-growth era, where lavish corporate profits (and multi-millionaire corporate executives) become targets for public action. So expect the unexpected. Read… What Will Cause the Next Recession? ← Is San Francisco Housing Suddenly Going on Sale? I would frame the question differently. To my mind the appropriate question is not what will cause corporate profits to break. I along with most people doubt the veracity of corporate profit reports. Thus I have my doubts that such sham profit reports can break on a scale that can effect the markets, especially since the market advances in reliance on only a very few very high multiple stocks. If one high multiple high flyer should falter, anther will replace it. In my view the question should be what will break those stock buyers who are willing to endlessly take on more leverage are further pump the high flyers, disregarding risk? I do not know the answer. I suspect the Central bankers are behind these buyers, and might regard them as too important to fail. More evidence for my theory that the tide has changed, and now runs against the practices that for so long boosted corporate profits. Inside the Uber apocalypse: Why the fast-growing tech giant could be in serious trouble. Uber’s shady practices have been the subject of much debate — and now they could be the subject of a court ruling. By David Dayen at Salon. Challenges have arisen to Uber’s evasion of labor laws by using faux “independent contractors” and mandatory arbitration in corporate-friendly forums. The ruling might have broad consequences. If Uber can break the completely artificial shortage of taxi licenses that has seen the price of the plate approach a million dollars in some cities- I’ll put up with a few imperfections. I read the Salon piece- benefits, overtime?? What’s he talking about. The taxi drivers around here are already self- employed, they lease the cab from the plate owner. Are they on salary where you live? BTW- you will almost never encounter the owner of the license. The thing that sickens me about this privilege to drive a taxi costing hundreds of thousands is that it ends up as a tax on the poor. Maybe in New York the affluent take taxis- where I Live it’s overwhelmingly those who are too poor or elderly to drive a car. Disclosure: I had a low level DUI a few years ago and had to cab and bus it for 3 months. My costs were much higher than running my car. We are always looking at various levels in the economic pyramid to judge its health. 1) The once wealthy Western consumer has had all their high paying jobs off-shored. As a stop gap solution they were allowed to carry on consuming through debt. They are now maxed out on debt. How does the increase in Health Care spending as a percentage of GDP, going from 2% of GDP to 17% of GDP since 1970 fit into your calculations? Healthcare, including Big Pharma, is the fastest growing sector in the S&P500 – with soaring revenues and profits, directly and indirectly extracted from your pockets, largely based on monopolistic structures and behaviors. There is no free market in healthcare, and healthcare companies love it! I dispute that health care should be included as a component of GDP. Because it negatively impacts the economy, it should not just be added to GDP as is. Reasonable health care cost (determined by a comparison with similar costs in other countries) should be separated from the extortionate overcharge portion of the costs and only the reasonable costs should be an add on to GDP. The extortionate overcharges diminish the health of the economy and should be subtracted from GDP because we are not getting any value for the money we waste on the overcharges. It is generally agreed that our health are costs are at least twice as much as such costs elsewhere. The extortionate costs cancel out the reasonable costs. Thus, no health care costs should be part of GDP. A few years ago maybe 3, the UK narrowly missed a technical recession and surprised everyone. The answer: It was a cold winter and the spending on fuel bills that quarter was just enough to push GDP out of negative territory. So avoiding recessions is easy- just leave the windows open. I take your point but there is little chance that the definition of GDP will change. I totally agree: GDP (which measures how much money is spent and so is a measurement of flow) is a terrible measure of an economy, for a number of reasons, including the issue you touched on. Breaking a window on purpose and fixing it also ads to GDP, famously. 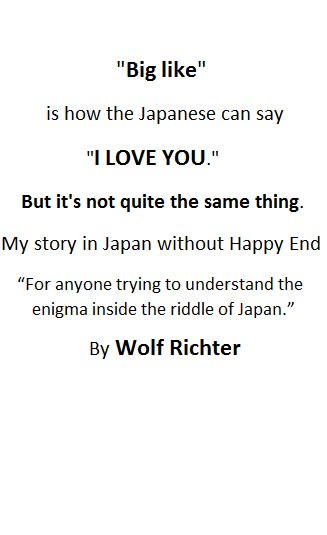 It’s really idiotic. But that’s the measurement we’re stuck with. This is nonsense. There is obviously NO relationship between corporate profits and stock value. As a self-employed business owner, it’s easy to figure how much profit or loss I am making as I conduct my business. One thing is for sure, if I can’t make a profit, there’s not much point in staying in business. The companies on the S & P 500 should be no different, but they are. Mr. Kummer chronicles the correlation of profits to market cap quite well, and he’s dead on that things are going to need a correction between the two sooner or later. Amazon should be the poster child for this! Wealth inequality is a destabilizing force that is going to be reckoned with. Companies can’t sell products if the masses are broke. Sweden is trying to eliminate cash, and punish those who have savings by confiscating some of the money they keep in the bank by ‘negative interest rates’. Bottom line: if a company does not make a profit, it should not have a share price that stays flat or increases. If I understand the news correctly, the DC bandits have passed a budget with an unlimited debt ceiling. If this is correct then put on your seat belt because we haven’t seen anything like it yet. Because I am sooooo cynical, I expect the markets to explode from all the spending they will do to grease the election results. Thanks for the article! I totally agree with your observations of past trends, and have privately concluded the same for years. That bit about peace between atomic powers is especially true, though I feel I should mention that already since the 1800s, death by violence has been decreasing exponentially, even through the world wars. Our slide in that direction is just gradual enough that people won’t mind .. and anyways, we are getting used to the fact that it takes a few programmers to write a winning app. Or in another decade, a few people to design a fully robotic kitchen robot/whatever. We’ll understand why they are filthy rich, and we’ve lost our job as chef. So why should it be cyclical on a 30-year timescale? Perhaps we are looking at a coming 50 to 70 year period in which nothing much happens, just a great stagnation spiced with occasional technological breakthroughs, chronic unemployment due to increasing automation and concentration of wealth all the way. I think most Elliot ‘long wave’ folks would say we are approaching the END of a period in which nothing much happened. No big wars- remember, from the end of WWI to the start of WWII was only 21 years. We have had warnings of a major crash most recently in 2008- but this was averted at the cost of running the US debt to 18-19 trillion. All commodities traded in Chicago are down, oil most notably. This means the intended inflation that would let the FED and Treasury escape the debt has not materialized. Of course outright deflation would doom them to default- as Japan seems to be doomed financially. The Chinese boom is over with god knows what results. So enjoy the interesting times in which we live- fear not stagnation. Although if it was on offer it would be an idea to settle for it. Clarification: when I said that Japanese society was more stable than the US – i compared it to the US because this is a US site and the US is the context or baseline. Japan has arguably the most stable society in the world – it is certainly the most homogenous, with almost no ethnic of religious fault lines. In search of short term profit and dividends Wall Street has led US companies down a blind alley. They have frowned on long term investment and R&D as these dent short term profits and dividends. They prefer layoffs, asset stripping and mergers and acquisitions to boost short term profit and dividends. Companies that once issued stock to grow now take on debt to buy back their shares that increase the share price and dividends for the other share holders. Increasing stock was always much better than debt for investment. With stock you pay dividends depending on how well the company is doing and it doesn’t drain the company in the bad times. Debt repayments stay the same good times and bad. Wall Street has strip mined the real companies of the US economy and left them in no position to grow without long term investment and R&D. The UK was the last super power and China will be the next. To see how bad it is read Michael Hudson’s book “Killing the Host”.